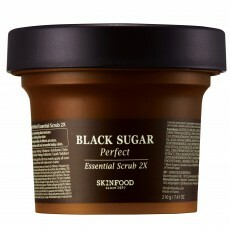 Skinfood Black Sugar Perfect Essential Scrub 2x comes in a bigger tub compared to Skinfood Black Sugar Wash Off Mask. This scrub is formulated with granules of black sugar, refined rice wine and natural plant oils to transform dull skin into a clear, smooth and glowing complexion! Enjoy the citrus smell of this scrub while gently massaging it on the skin. It won't dry your skin, thanks to the perfect blend of botanical oils and sugar! After cleansing, scoop adequate amount, spread on moist skin and gently massage. Rinse off thoroughly with lukewarm water. Tip: If your skin is too sensitive, add a little bit of water or cleansing oil, then massage on the skin.